I arrived just in time to catch the end of The Smoking Hearts, and their lead singer diving into crowd, complete with mic and cord and winning over a few fans; second support Dayshell tried hard, but the singer admitted he had some throat problems and you could tell. With the preliminaries out of the way, it was time for the main event – and Halestorm duly took the stage to a triumphant reception and without messing around, launched straight into “I Miss The Misery” and “Love Bites (So Do I)” and set the tone for the evening. There was precious little down time in the whole set; song after song kept the crowd going, only one slower track in the piano led Lzzy solo effort “Break In” and a short two minute Arejay drum showcase allowed for any pause to catch breath – it was an intense gig from start to finish! 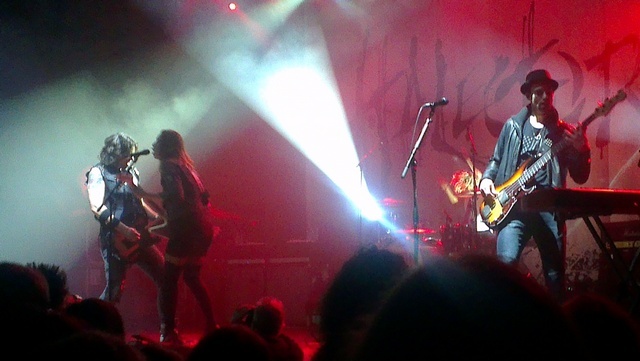 Lzzy takes a lot of the attention, and I’ll get to her, but the rest of the band deserve some praise too. I was stood in front of bass player Josh, and he put in a big shift, often switching to keyboards for a moment and adding backing vocals. He often gets overlooked, I feel, but he deserves a wee moment in the spotlight. Arejay and Joe don’t need much of a spotlight shone on them – everyone by now know how good they are. Arejay’s antics at the back of the stage are incredible, the man seems to be the human version of Animal from the Mupppets (that’s said as a compliment, by the way) and his energy is infectious. Joe’s guitar was spot on all night, never once missing a note or slowing down. His work in the Dio and Judas Priest covers especially was incredible. Which leaves Lzzy… what’s not to be said about that woman? She has an incredible voice, that filled the room all the way to the back with ease. She’s also a damn good frontwoman – she engages with the crowd, looks people in the eye constantly – Glasgow was under her spell last night for sure. She made a connection with people and that is a priceless skill. It certainly doesn’t hurt that she’s easy on the eyes too – and that may be a slight understatement, if I can allow my horrific crush to take over for a while! I genuinely get the feeling that the band enjoyed every single minute they were up on stage; it’s an easy thing to say, but there’s a few gigs I’ve been to where it’s felt like the guys on stage were just going through the motions on autopilot – not with Halestorm. They threw themselves heart and soul into the gig, and it was all the better for it. Highlights? The cover of Fleetwood Mac’s “Gold Dust Woman” was jaw dropping; “Don’t Know How To Stop” sounds so much better live, much more urgency and oomph to it than on record, and finishing the night with “Here’s To Us” is just the perfect way to send a crowd off into the night on a high – it’s a great singalong, feel good song to close out on. I thought Halestorm were great when I saw them support Bullet For My Valentine, and again supporting Alter Bridge… seeing them headline their own tour, and work a longer set? They’re so much better. Much more comfortable knowing that people are there to see them, and familiar with the material, they relax and open up more. It makes for a much better dynamic and the show just flew in. Roll on the next tour… I’ll be there. You should be too.